Ashley Madison Penalized By Google? Not Ranking For It's Own Name. Home > Google News > Google SEO > Was Ashley Madison Penalized By Google? Not Ranking For It's Own Name. Was Ashley Madison Penalized By Google? Not Ranking For It's Own Name. 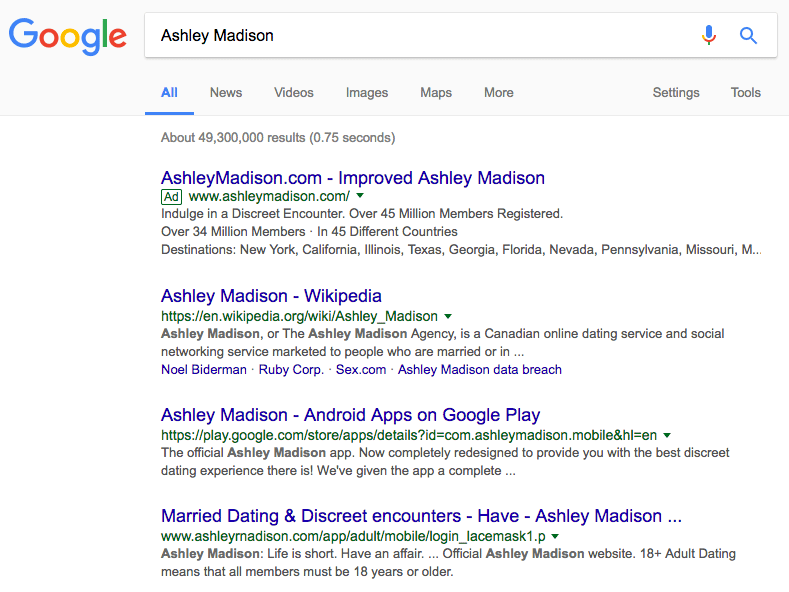 Was Ashley Madison's web site penalized by Google months ago? Maybe. Marie Haynes posted in the Google Webmasters Help forum examples showing the "mysterious" ranking issue for the controversial business and web site, AshleyMadison.com. In short, if you search for [Ashley Madison] or even misspellings of the name, it won't come up on the first page in Google.com results. Notice the fake domain ranking pretty well, it seems like an affiliate. Marie seemed to have been hired by Ashley Madison to debug the issues and she is seeking advice. She said the "site was hacked and had a lot of publicity about this hack in July of 2015, four months before the ranking troubles happened, but I don’t think that the problems are connected to the hack." This shows a massive dive in traffic from Google for people searching on their business name in Google starting in November 2016. A site typically won't rank for its name if the site is blocking Google from their home page, asked to be deindexed, was hacked or there is a pretty big penalty. Update: A month later it returned in Google, more over here.